We are ideally situated for those wishing to explore the surrounding areas of Beaulieu, Bournemouth,Salisbury, Stonehenge, Portsmouth, Longleat or the coast just 1¼ miles away. The village of Everton is located approximately two miles west of Lymington on the A337 and a mere half hour from Southampton. Directions to Efford Cottage from the west. Follow A35 to Poole and Christchurch. At Christchurch join A337 signpost to Highcliffe and Lymingtom. Drive through Highcliffe traffic lights. After Highcliffe turn right at small island. Follow road through to Old Milton, at traffic lights carry straight on. At island follow signpost for Lymington. Through Downtown, The Royal Oak on your right. After 1 mile pass Everton Nurseries on your left. After 600 yards pass turning to Milford-on-Sea. After 300 yards pass Knightcrest Park on your left. Efford Cottage is 150 yards ahead of you on the left hand side. Mileage: approx 8 miles from Christchurch. 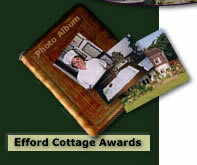 Directions to Efford Cottage from North and East of Southamton. Join M27, signpost Bournemouth and the West. At junction 1 of M27 exit then follow signposts to A337, Lyndhurst. At Lyndhurst traffic lights turn left and move to the right hand lane. Follow signs to Brockenhurst and Lymington. Drive through Brockenhurst and on to Lymington. Pass under Railway Bridge on the outskirts of Lymington; go straight on at mini roundabout. At traffic lights, keep in outside lane and go through lights. At pedestrian lights move into outside lane and follow sign to Christchurch and New Milton. At the mini roundabout go straight on passing the Shell Garage on your left. Pass car sales forecourt on your right. Down a hill, then up a hill. Through a right then left zigzag bend. As you come out of the left hand bend indicate right. Efford Cottage is on the right about 150 yards ahead of you.